'''Obsidian''' is a very resistant block. 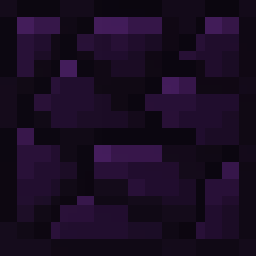 Obsidian is a material found naturally in [[Nether]] and in [[The End]] or created in the [[Overworld]] when a [[water]] flux makes contact with a [[lava]] source block. Obsidian can only be mined with a [[Pickaxes|diamond pickaxe]] and is the toughest ''mineable'' block. This block resist explosions. [[Nethereye]]s, when killed, may drop obsidian.